How we safely and rationally dispose of garbage that is constantly produced every day in human history, especially in urban infrastructure, is the greatest and eternal issue. In the highly advanced capitalist society of the 21st century, you will see things like seemingly reduced trash by using the international economic disparity like carbon dioxide emissions trading or garbage business becoming popular such as placing a huge amount of waste in a container and sending it off to developing countries to have them dispose of it cheaply. However, these only make the garbage wander on earth with no destination and do not fundamentally solve the issue of garbage disposal. In this project, Niwa takes his garbage from Japan to America. 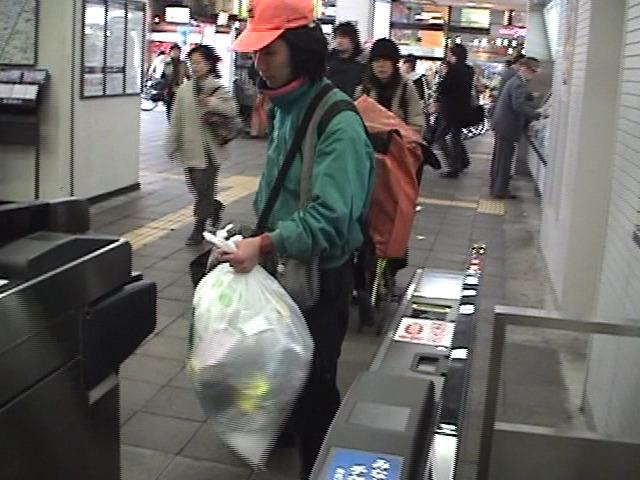 This is a video work that records a sequence of scenes of the artist traveling – boarding a plane to America with household garbage from his house in Tokyo including food waste, bringing it to a garbage disposal facility in San Francisco, and having it disposed of. By crossing international borders while ignoring the local rules of garbage disposal, this work offers a critique of how the micro-social rules mean nothing internationally and examines where the garbage that we produce day by day comes from and where it goes to.